Originally I bought the Makala MK-S for my dad, he’d expressed an interest in learning ukulele very shortly after I started playing. Unfortunately due to the arthritis in his hands it wasn’t to be, he just couldn’t get his fingers into the required positions, even with the uke chord changer that I got for him. And so it is now in my possession, shortly to be sold on but I figured it was worth writing a review of the Makala. 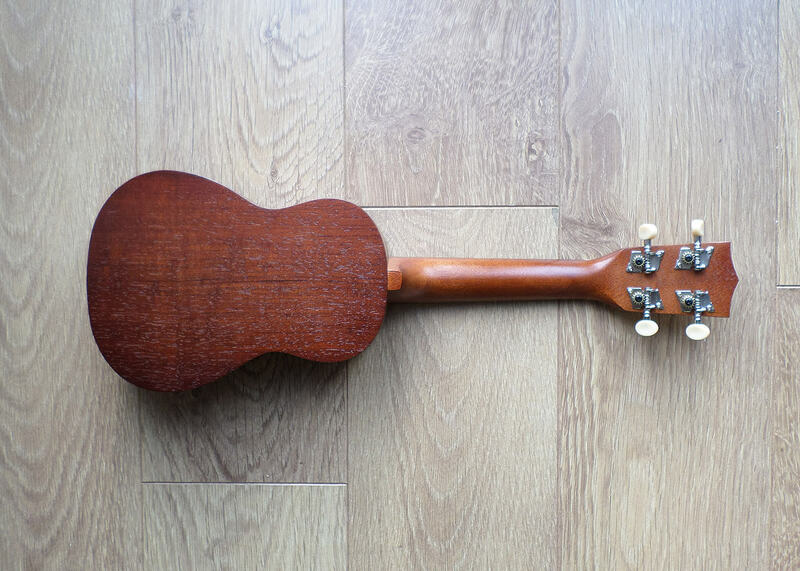 The Makala MK-S clocks in at around £35 ($50) and for your money you get a soprano sized laminate ukulele with a satin finish that is actually quite easy on the eye. The top, body and sides are made from agathis, with the fretboard and bridge made from rosewood. 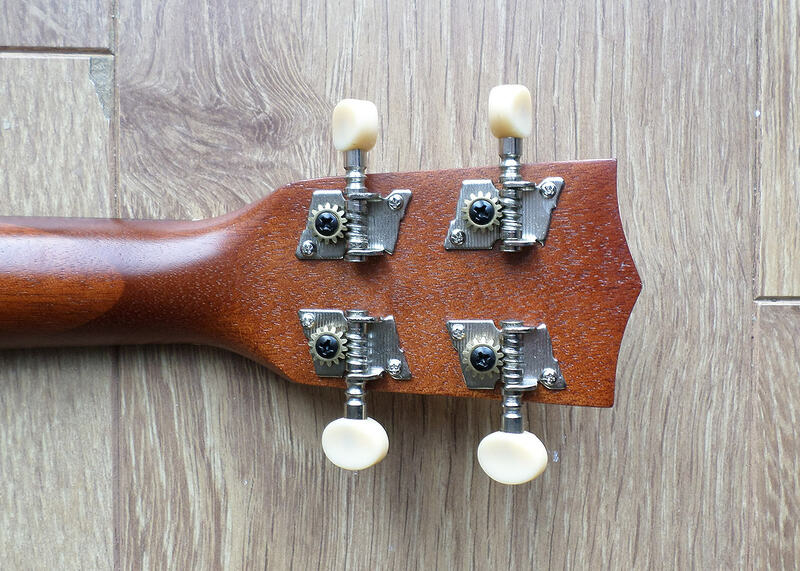 The tuners are pretty standard geared ones. When I initially bought this for my dad I paid extra for Aquila strings. When you consider other ukuleles at this price point it certainly holds it’s own and then some from a visual perspective. 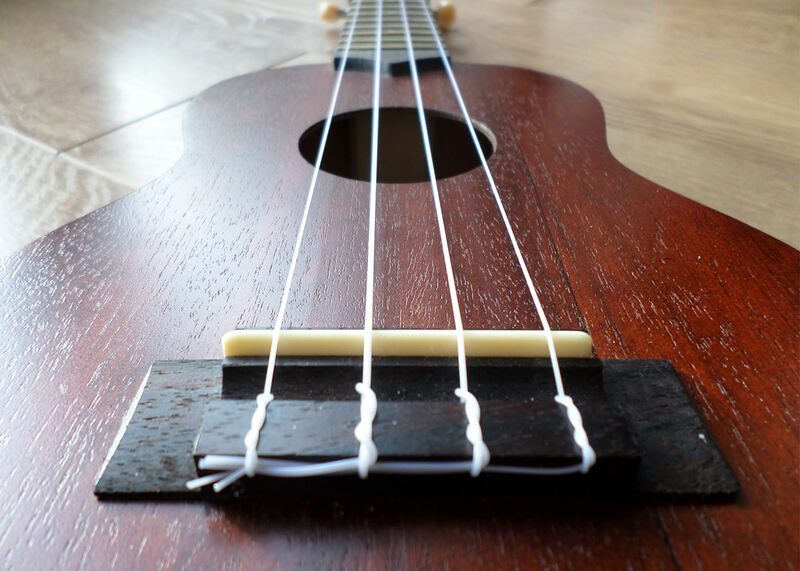 The tie-bar bridge might be an issue for some newcomers to ukulele who would prefer a slotted bridge but regular readers of Ukulele Go will know that I’m not a slotted bridge type of guy. In the hand it feels pretty decent too, the weight is pretty much bang on in terms of what I like (I’m a bit Goldilocks, not too light, not too heavy) and the distribution of the weight means it feels comfortable to play standing up too which isn’t always the case. In fact I’ve found myself playing this ukulele standing far more than any other that I own over the past few weeks. 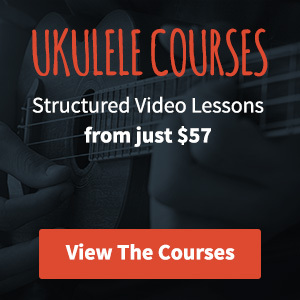 At £35 ($50) it just sits slightly above those £20 ukuleles that seem to stick in Amazon’s no.1 spot but the difference is there for all to see. While there’s nothing spectacular going on here, it doesn’t really have any issues – there’s no real defects to be seen anywhere. When it comes to laminate ukes, they seem to fall into one of two camps whenever I play them. They’re either a bit tinny or they’re muted and somewhere between those brackets is the holy grail of sound. This one falls more into the tinny category. When strummed it kicks out a fair bit of noise and if you’re quite heavy handed then you’re going to really notice that. If you’re the kind of person that doesn’t bash the strings quite so hard though you’re going to get the most out of this uke. It seems to really respond to a bit of restraint. I’m probably being a little bit over critical of the Makala here though and overall it isn’t bad sounding ukulele. I’ve found it be really well suited to a bit of fingerpicking mainly due to the volume that you can get from it. The added volume allows you to really easily build dynamics into your playing. One confession to make, this ukulele has been set up incredibly well. The action has been brought right back to what I would think is pretty much it’s limit and that’s made a huge difference to it’s playability. 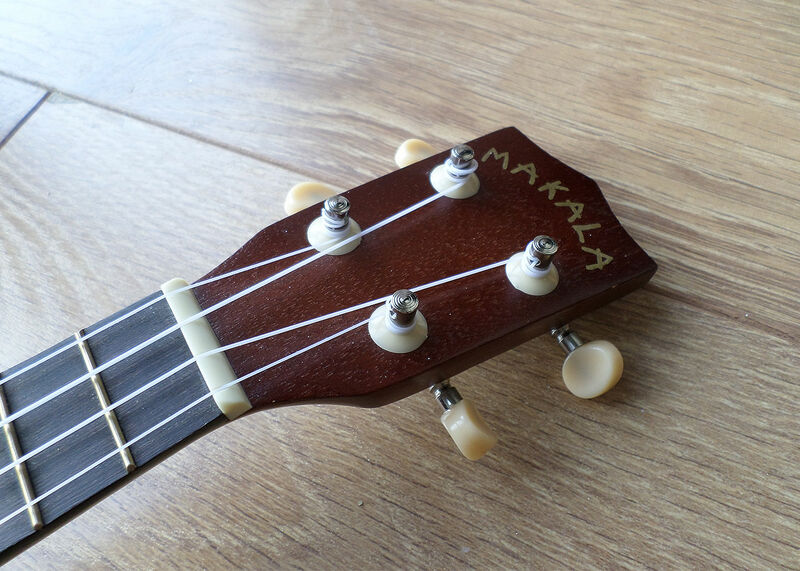 For quite a long time I’ve recommended Makala Dolphins (among others) to ukulele newcomers but it’s fair to say not everyone wants a dolphin on their ukulele. 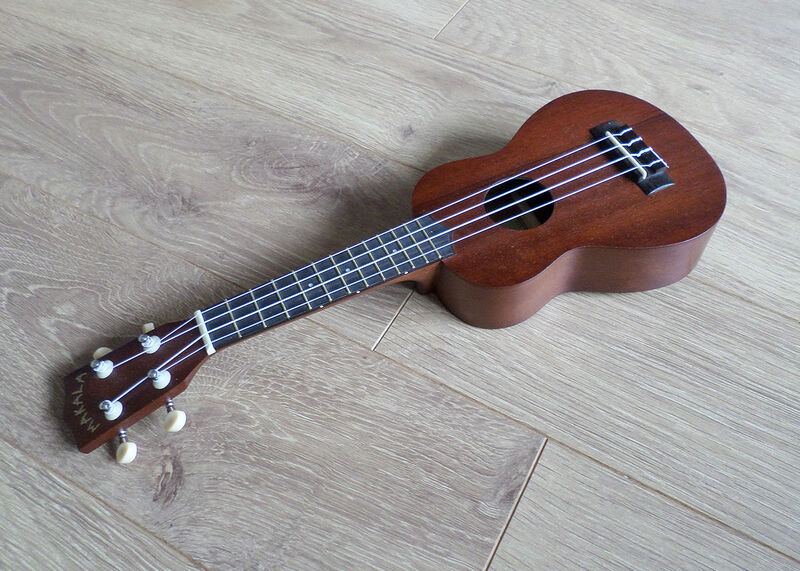 While it’s not the same uke (the Dolphin has a plastic back and sides with an agathis top) and the sound is pretty different, in my opinion it’s on a par with the Dolphin in terms of value for money. The Dolphin gives a more muted tone when strummed which is a little bit more forgiving to newcomers but it’s a tone that also has it’s limitations. On tone alone if I were a newcomer to ukulele it would be the Dolphin, if I were to take looks into account it would be the MK-S. The Makala MK-S from Kala is a decent ukulele that I would recommend to anyone looking to get started on a budget. It’s a bit more tinny than it’s cousin the Dolphin but then it hasn’t got a dolphin on it. There are cheaper ukuleles out there (if you’re really strapped for cash) but I’m not sure if there are any that are better than this. Worth a look. I received a Makala Mks for Christmas and I have to say that I’m really ok with it. Ok It’s my first Uke and it’s a gift from my wife but, it’s ok, I can learn a lot of things, the sound it’s not bad and it stays in tune for a long time. So I would like to say “thank you” for this website and these lessons, they really help me. Have a good evening from France. Hi Cheick, it’s a good starter uke and you should have plenty of fun with it – your wife chose well. I’m really pleased that you’re finding the site useful!